Neptune Hydraulic Diaphragm metering pumps are typically used for chemical metering in process and agricultural industries. Chemical metering pumps are avavilable for high and low pressure applications with manual and electronic stroke control. 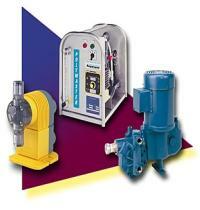 Please click on the Metering Pump button to view the full line of our metering pump products.